What is our Around the World challenge? In 2017 our first ever Around the World event saw more than 24,000 children from 85 schools and youth organisations across West Yorkshire walking, skipping, running and wheeling a total of 24,900 miles - that’s the circumference of the Earth! Raising an astonishing £92,000 in sponsorship. In 2018, we went even further, beating that distance and raising an amazing £100,000! With your help, in 2019 we’re going even further: this time around the world – and back! Which sounds like a really, really long way, doesn’t it? But the more children and the more schools that get involved, the further we’ll go. And the more we’ll raise to help local children with life-shortening conditions and their families. We’d love your school or youth group to get involved, get sponsored, get active and make a difference to local children and their families. Register your interest online today. secondary school students to travel TWO miles. Just think how amazing it would be if each and every pupil raised at least £10! When are we setting off? We’ll be taking on the challenge during Children’s Hospice Week 20th-26th May 2019. If that week doesn’t work for you, there’s no reason why you can’t travel a bit earlier or later. It’s simple: everyone, of every age and ability, can do their mile however they like. You can run, walk, skip, hop, jog or swim; you can do it in a wheelchair, on a bike, or on roller-skates. You can even do it in fancy-dress. As long as you get sponsored and get going! We love seeing our schools get creative to bring Around the World to life! Because amazing things are achieved when we work together as part of one HUGE team stretching right across our community. Because it helps raise vital funds for our charity as well as awareness about children's hospice care so we can reach more families who could need our help. 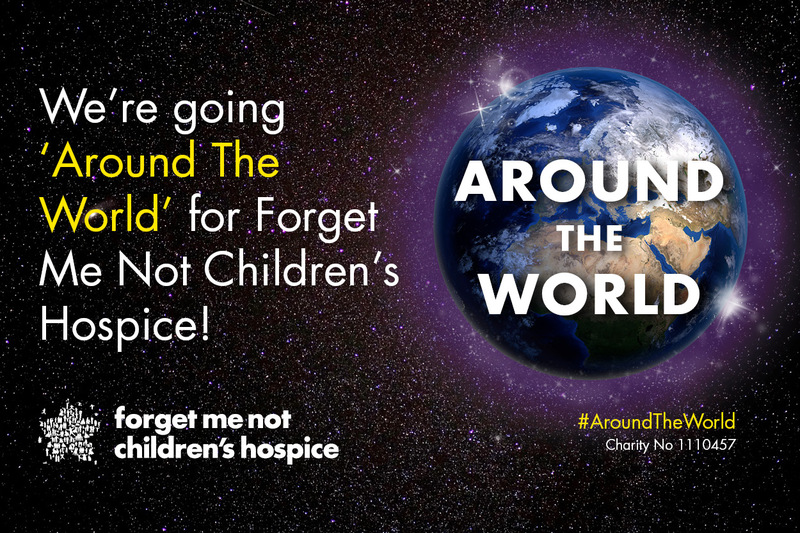 "The Around the World challenge is a fantastic campaign for schools across West Yorkshire to get involved in, raising awareness and vital funds for a great cause, whilst getting pupils active and part of something truly amazing. I would recommend any school looking to run an easy yet effective fundraising PE challenge in 2019 to get involved." "As soon as we heard about the challenge we were keen to support Forget Me Not in their quest to travel Around the World. This is a very worthy local charity and we’re proud to play our part and help make a difference"
Any trip needs planning and some essential kit. But don’t worry, we’ve done all the work for you! We’ll supply sponsorship envelopes, stickers and certificates for every child plus lesson plans and an assembly to get everyone started! Everything you need to travel. You can also download your cover letter, sponsorship envelope, social media graphic and poster!